Sam Foley admits a ‘massive weight’ has ben lifted off the shoulders of the Cobblers players after they secured their first home win of the season on Saturday. Town saw off previously unbeaten Forest Green Rovers in sensational style, with Andy Williams netting in the fifth minute of time added on at the end of the game to secure a precious 2-1 victory. 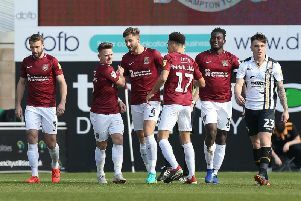 It was only the Cobblers’ second league win of the campaign, and only lifted them to a still lowly 19th in the Sky Bet League Two table, but Foley says psychologically, it has given the players a huge boost. “The lads are happy. The amount of work we have been putting in and not seeing results, it has been difficult for them,” said the midfielder. “But on Tuesday morning they came in, and everybody was smiling, which is brilliant. “It is a massive weight off the shoulders, and it was great on Saturday. Williams’ late goal sparked frenzied celebrations on and off the pitch, with some supporters unable to contain themselves as they briefly raced on to the playing surface at the corner of the south and west stands to celebrate with the players in an outpouring of joy. Foley knows that’s not something that can normally be allowed to happen, but he admits he loved it! “Obviously, scoring a goal at any time is great, but to do it in the last minute, with the fans running on the pitch and joining in the celebrations it was a great feeling,” said the former Port Vale man, who has been one of Town’s best players this season. “For me, I love playing at home, and for every club I have played for I just love it with the atmosphere, and when they get behind you it is great. “They are starting to do that now and are really buying into the effort the lads are showing, the football we are playing, and hopefully the relationship between us and the fans continues. “I loved it on Saturday, and it kind of took me back to my non-League days when there weren’t many fans, but they loved the game and just did what they wanted as there was no stewards - that was carnage!